One of my students wrote a story about me. I thought I’d share. It’s not perfect, which makes it precious. Before you judge me as a teacher who cannot teach spelling and grammar, please let me give this small disclaimer: In the writing process, we encourage children to get their thoughts down on paper and write with voice. If too much emphasis is put on perfect spelling, children are inhibited and will only write the words they know how to spell instead of taking risks and using larger vocabulary. That tends to limit them as writers. During the editing and revising stage of the writing process is when we polish it up and fix all the errors. Transcription after some editing in case you’re not yet a pro at reading phonetical spelling: Me and Mrs. Wheeler are the same. We both like riding horses. We both get short tempered when people interrupt us. I just, I love my teacher. I would not go to a different classroom. But she is too classy. She always wears dresses that are classy. 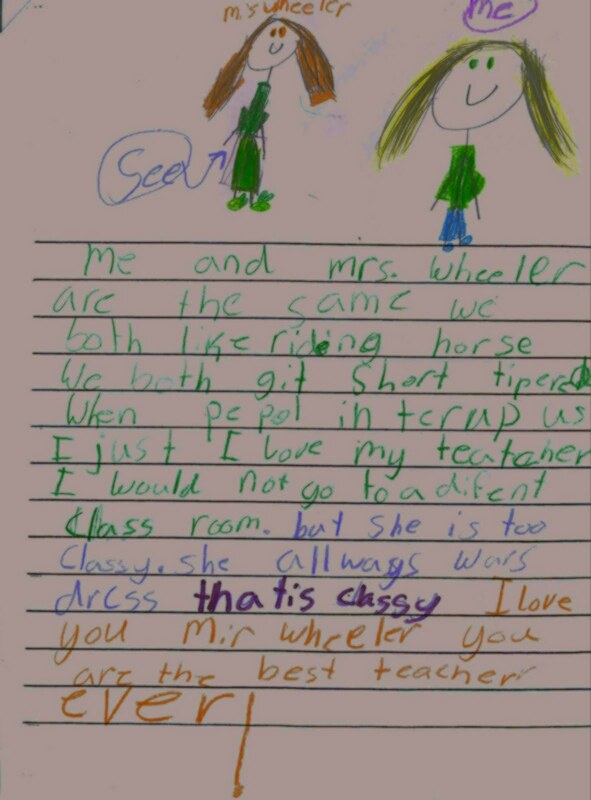 I love you Mrs. Wheeler. You are the best teacher ever! Another disclaimer: Really, really, I’m not terribly short tempered. Not too terribly anyway. It’s just that I’d had a certain little boy talking out of turn entirely too much. Right before this writing lesson, I had sternly pointed my finger and reprimanded him about interrupting me. I guess it was perceived as a bit short tempered. Maybe a little. See? 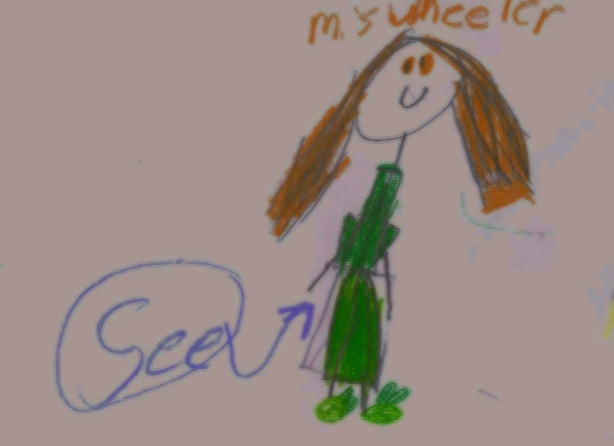 That is a classy green dress. See my green bunny slippers I’m wearing? See I’m smiling. I do smile at kids. Aren’t kids the cutest? Makes me almost want to have one. And then I go stick my head in the microwave.